If you do any tiling or flooring you should know the value of our cordless multi-tool reviews. Oscillating multi-tools represent the modern replacement to the undercutting saw. They provide quicker, more efficient cuts and can greatly reduce your time on the job. As these handy tools have gone cordless, it has only made them more helpful. We did a cordless multi-tool shootout where we took most of the major players and pitted them against each other. Testing run-time, vibration, and power, we noted that manufacturers have not created all of these tools equally. With advances like the Fein Starlock oscillating multi-tool system and new tools that offer tool-free blade changes, multi-tools are only getting better. 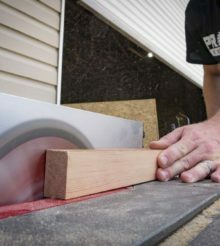 The next phase is understand which multi-tool accessories will hold up and stay sharp when you cut into harder material. Many a blade has been dulled by heart pine and oak. Accessories like the Bosch OIS system make compatibility issues virtually a thing of the past. Unless you happen to own a Festool Vecturo OS 400 multi-tool which has a proprietary blade. Hopefully our multi-tool reviews will help you decide which platform or product best meets your particular needs.